This is our first time staying at a bed & breakfast, is a comment we often hear. We can only speak about the experience you’ll have here at Barrister’s of course, but if you’ve never stayed at a bed & breakfast, and are curious about the difference between us and a motel or hotel, read on. 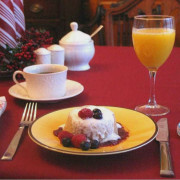 Your stay will feature a three course Breakfast with your dietary needs in mind. The most important difference you’ll probably notice is the level of personalized service. When you arrive, you’ll be warmly greeted and shown through the house to familiarize you with guest common areas and the many extra amenities you’ll find at Barrister’s, like guest refrigerator, microwave, beverage center and of course the formal dining room. Then you’ll be shown to your room where we’ll help you familiarize yourself with its special qualities and answer any questions you might have. You’ll be given a key to your room which also gives you access through the front entry, so you have complete freedom to come and go as you please. We have well-lit off road parking behind the house and a garage for storage if you’re traveling with bikes or other equipment. As you settle in, you’ll come to appreciate the historic quality of the home, built with care by master craftsmen and restored to today’s standards. We strive to add thoughtful details to make you feel at home-and pampered at the same time. 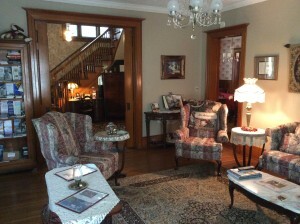 You might be interested in learning of the home’s history and the interesting families who’ve lived here. 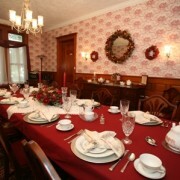 Breakfast is usually served restaurant style in our dining room. You’ll be seated with other guests at a spacious table area where we serve a plated hot entree, in-season fruit, homemade breads or muffins and a variety of beverages. Special dietary needs or restrictions are no problem with advance notice. We usually serve Breakfast at 9:00 AM but we make every attempt to meet your schedule and needs, and try to serve you at a time that’s convenient. We even offer a breakfast tray delivered to your door if you’re inclined to have breakfast in bed with one day advance notice. There’s lots of room at Barrister’s for guests to relax. Common areas include a spacious guest living room with gas lit fireplace, large front porch and a stone patio with fire pit that’s perfect for evenings with good friends and a favorite beverage. Once you’re settled, we’re usually close by to answer any questions you may have regarding restaurants, directions, area attractions or anything else you might need to know, but we also allow you to have all the space you need to be comfortable. We believe that one stay and you’ll understand why we believe that at Barrister’s your bed and breakfast experience will be the highlight of your vacation.